An attack by the enemy captured brigade headquarters and ammunition dump. 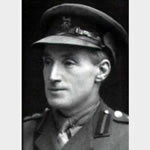 Captain Gee, finding himself a prisoner, managed to escape and organised a party of the brigade staff with which he attacked the enemy, closely followed by two companies of infantry. He cleared the locality and established a defensive flank, then finding an enemy machine-gun still in action, with a revolver in each hand he went forward and captured the gun, killing eight of the crew. He was wounded, but would not have his wound dressed until the defence was organised. Initiated into Roll Call Lodge in 1907. On 15th November 1911 he was on the roll of Alma Lodge as a Petitioner along with 7 others from Roll Call Lodge and remained a member of oth lodges until at least 1921.